Alumni and Caltech Associates members Jim Sagawa (BS '63) and Karen Roberts (BS '74) join mascot Bucky Beaver in declaring their support for Caltech undergraduates. 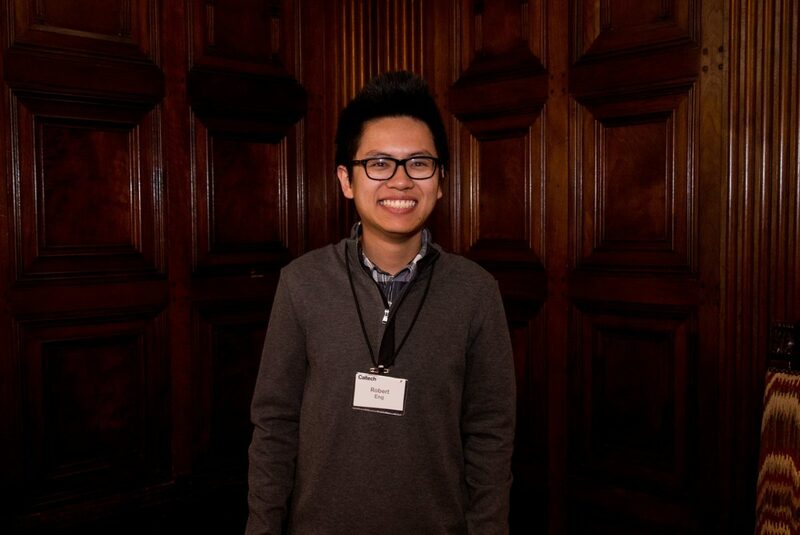 "The beaver may be our official mascot, but to many outside our community, Techers are considered unicorns," says Robert Eng, a scholarship recipient and member of Caltech's Class of 2018. At Caltech’s annual scholarship reception, held this year on Sunday, May 20, members of the Institute’s community celebrated the university’s unwavering standard of academic excellence as it is embodied in scholarship donors and recipients alike. The annual scholarship reception at The Athenaeum provides an opportunity for friends of the Institute to talk with current recipients of named scholarships. 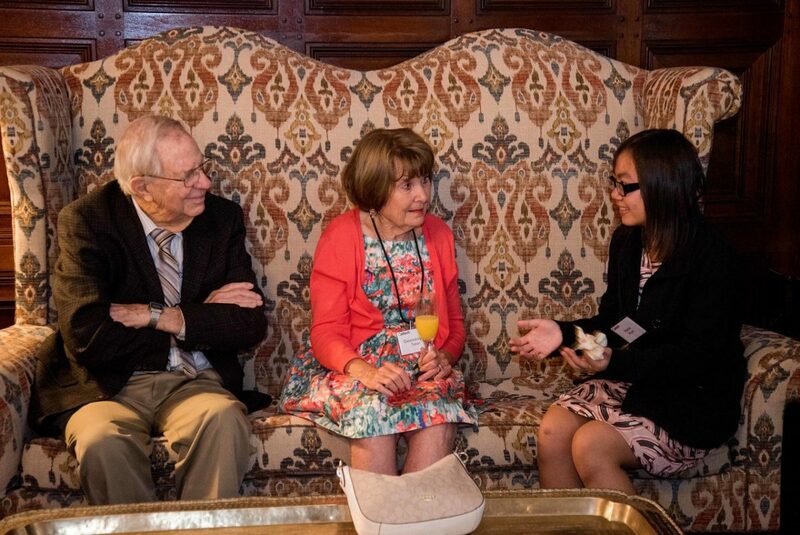 Here, John (BS '46) and Gwendolyn Taber converse with Karen Pham (Class of 2020). The Tabers, who are members of the Caltech Associates and Caltech's Torchbearers Legacy Society, have supported Caltech for seven decades. "I know I will leave Caltech with lasting friendships and a bond of camaraderie with all Techers, from both the past and the future," says Robert Eng (Class of 2018). "I am especially grateful to those who made my Caltech scholarships possible. The support I received lessened the financial burden on our family and allowed me to focus on my studies and the pursuit of excellence." 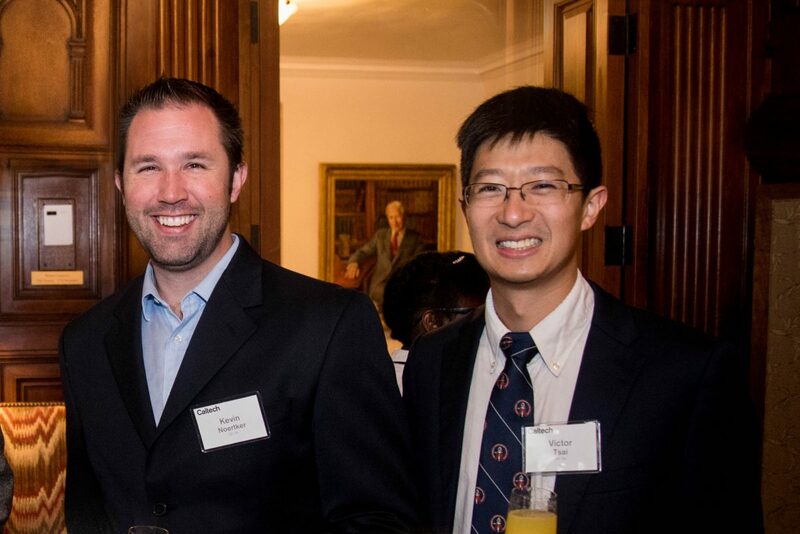 "Attending this gathering of students and alumni is a nice reminder that we're supporting not just a few individuals, but a larger enterprise of excellence in education," says Caltech professor of geophysics Victor Tsai (BS '04, right), pictured here with Kevin Noertker (BS '09). "It's amazing to see what people end up doing with a Caltech education." Both Tsai and Noertker are scholarship supporters. Caltech alumnus Michael Walsh (BS '81, center) addressed the attendees during the brunch program. "The whole of my career has been exhilarating, full of unique challenges," he said. "And it was my time as an undergrad at Caltech that allowed me to excel in that space." 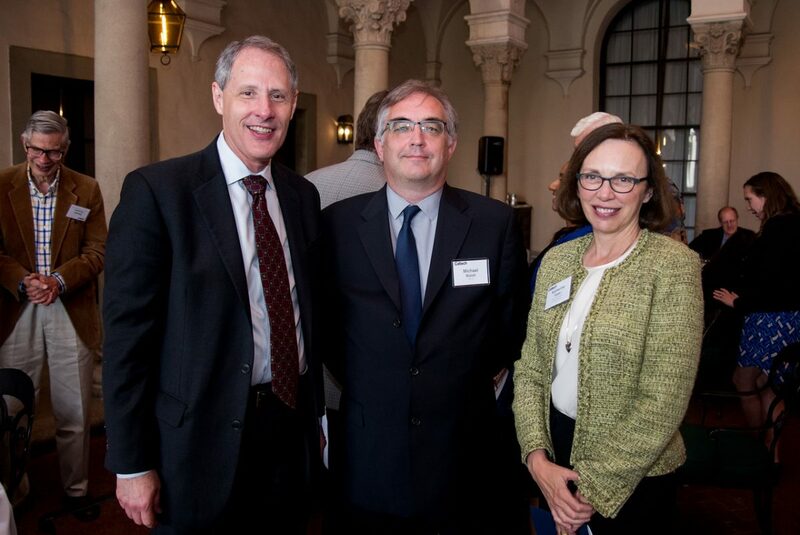 Walsh is pictured here with two fellow scholarship donors: Caltech President Thomas F. Rosenbaum, holder of the Sonja and William Davidow Presidential Chair and Professor of Physics, and his wife, Katherine T. Faber, Caltech's Simon Ramo Professor of Materials Science. 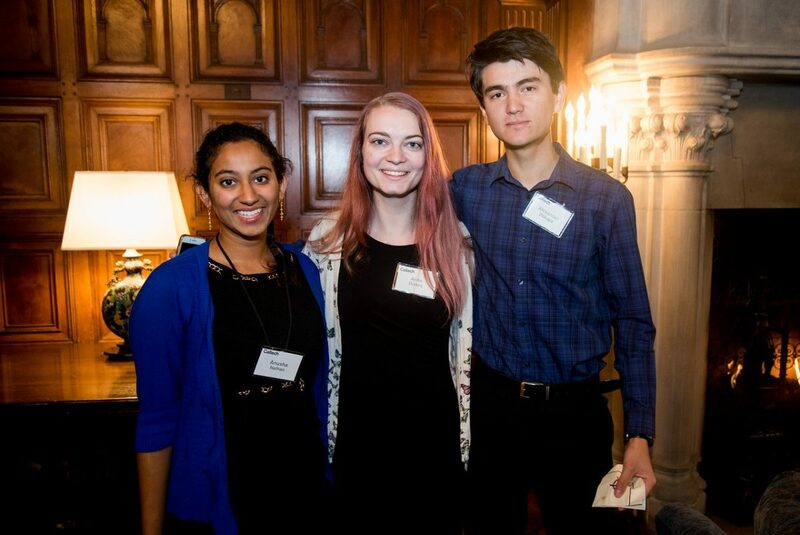 Event speaker Anusha Nathan (Class of 2018, left) is pictured here with Anne Dorsey (Class of 2018) and Alexander Zlokapa (Class of 2021), both of whom are also scholarship recipients. "Everyone is willing to share their experiences, their stories, their passions," Nathan enthused in her speech. "It's one of the things I love so much about Caltech. It's an absolute honor for me to be here today and meet all of you who made my Caltech education possible. I am eternally thankful because without you, I would not be standing here today." More than half of Caltech’s undergraduates receive financial assistance, so raising funds for scholarships is a top priority of Break Through: The Caltech Campaign. To uphold its need-blind admissions policy, the Institute has announced a long-term goal of raising $120 million in endowed scholarship funds and an immediate goal of securing $5 million in current-use scholarships for students today. In 2017, an anonymous alumnus set forth a fundraising challenge, offering to match all scholarship gifts or pledges of $75,000 or more with an additional $50,000. As of May 31, 2018, donors established 25 named scholarships through the challenge, helping bring the Institute more than halfway to its goal for endowed undergraduate scholarships.